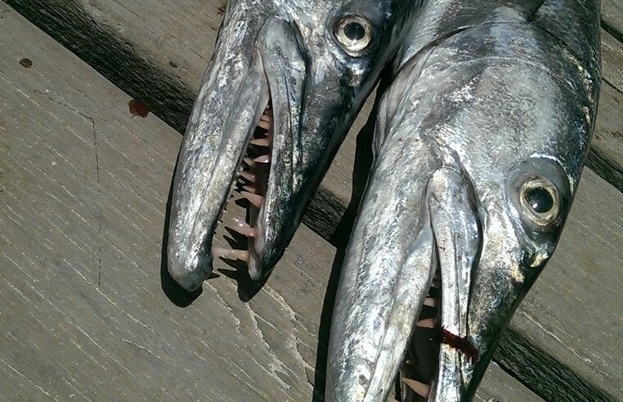 Nick takes us Barracuda fishing off the coast off Isla Mujeres where his friend managed an impressive haul. No better way to celebrate the National Fishing Month! 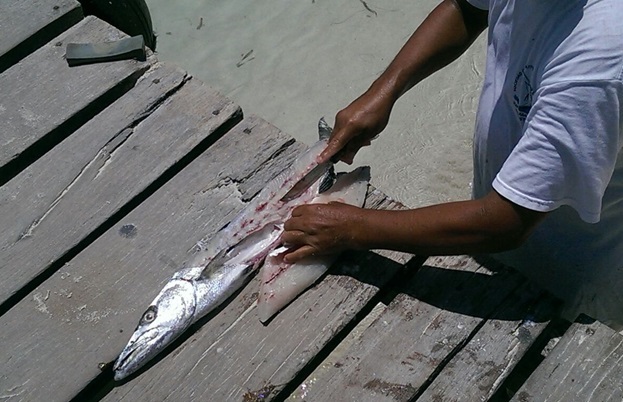 After several attempts at catching small Barracuda off a pier on the beautiful Isla Mujeres in the Gulf of Mexico it was clear that I could not compete with the locals who were using sardine live baits. I tried and failed to tempt the elongated scavengers, known for their large size and fearsome appearance with plastic lures, ‘why have fish fingers when you can have the freshest sashimi’ I thought! I decided I needed some local knowledge and my girlfriend Charlotte and I hired a boat to spend the morning fishing in a nearby bay. After an hour of trolling a needle fish deadbait the rod sprung in to life and I was in to my first Barracuda of the trip! The powerful rod and the 60 pound line soon had the fish under control and the 7 pound fish was lifted aboard ready for photos before being put in the hold. A similar sized fish followed shortly but now I was hungry for a monster... My prayers were answered within an hour when my rod bent over aggressively and I was clearly into a much larger fish. I set the hook before the fish went on an unstoppable run that saw 100 ft of line melt off the reel in seconds! The fish could be seen breaking the surface in the distance as she acrobatically tried to lose the hook. It was a good ten minutes before I got her under control and as she neared the boat we could see she was a monster. Her power was incredible and she dived deep under the boat forcing my rod tip under the water and me hanging on for dear life! To add to the excitement she jumped several feet out of the water just meters from the boat shortly before the captain expertly brought the still very lively fish aboard using a gaff. 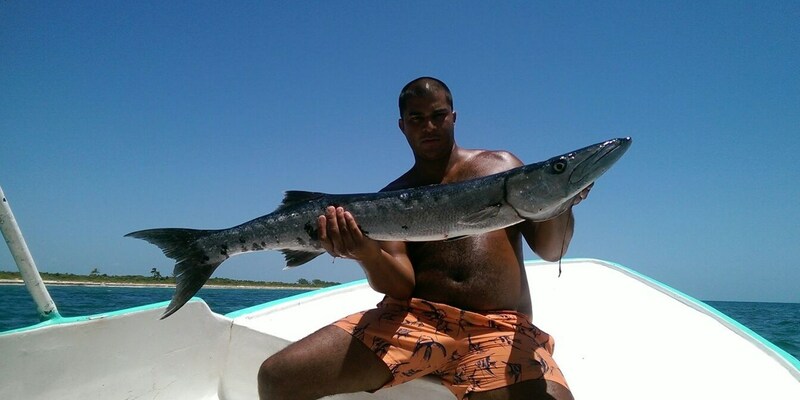 I was elated with my achievement especially after the captain told me that it was the biggest barracuda he had seen this month (around 20 lbs)! The excitement wasn't over though as I hooked in to another monster shortly after the first and after a similarly exciting and exhausting fight I was again holding another beauty, this time even larger at 25lbs. You know it's a really good fish when even the captain wants a photo with it. As we headed back to land there was even time for Charlotte to get in on the act catching her very first fish! Not a bad place (or fish) to break your duck and on your very first fishing trip (although she later admitted that at no point did she feel that this was a ‘fishing trip’). Holding the Barra for a photo was still slightly beyond the novice. The great thing about catching game fish like Barras is being able to freshly prepare and cook them straight after and this species make for a sublime meal. Mostly consumed as fillets or steaks the smaller fish have a far better taste cooked on a grill, pan-fried or BBQ. Barracuda’s are very popular in West African countries where they boarder the eastern Atlantic and it is customary in these parts to smoke the fish for soups and sauces as this protects the soft flesh from disintegrating in the broth and gives them a smoky flavour. On the Isle Mujeres however they were on the beach-front grill, filleted by the captain and cooked beautifully in garlic butter, served with typical Mexican sides of rice, refried beans and salad. A perfect end to a brilliant morning!